Well, what can I say about this literary trip to Hungary that I just came back from ? I might as well say it now, I have mixed feelings at the moment : I don’t really know if I liked The dispossessed, by Szilárd Borbély, or if I didn’t appreciate it at all. A weird outcome for a book that landed in my hands almost accidentally, and that I finally finished after a (way too) long reading time. The résumé was promising, advertising the story of a boy and his family in XXth century’s Hungary, which seemed to aggregate everything I am searching for with one book | one country : History, at a national but also at a human scale, with an immersion in the daily life of a foreign country and in a key period of its (re)construction. And though… I had a lot of difficulty interesting myself for this book ! Quaintly, the structure of the narrative reminded me of My First Sony’s. Indeed, the storytelling appears to be quite similar : we also follow a young boy relating his family’s background (with intrusions of his parents and grandparents’ memories, closely intricated to a global national souvenir). We also find the same rambling structure, non chronological, like a patchwork reassembling many years’s moments in disorder. There is even the same naive subjectivity in the narrator’s voice. And yet, the final rendition is absolutely different – unfortunately, in a way that I liked less. The various passages aren’t really smoothly linked, sometimes they are a bit repetitive : we don’t really trace a thinking path that would lead from an event to the next with some logical bound, and it is more like a succession of short episodes, like a serial compilation. The sentences, instead of infinitely extend, are short and efficient : it also gives rhythm to the text, but it is more syncopated. The writing style as a whole particularly unsettled me : poetic at some places, elsewhere in the text it flirts with gore, with some really rough scenes. This alternation is totally appropriate for the subject – an unvarnished life story, illustrating a merciless reality – but didn’t help me to enjoy the text. I appreciated the ethnographic quality of this piece, and also the peculiar point of view brought in by the narrator. However, I didn’t really enjoy this read, and I had to compell myself to go through this book. At the end, I was nearly disgusted from it, not advancing in this dark and disenchanted story while unable to like the author’s style. Anyway, I know that a lot of people actually loved The dispossessed (which is why is decided to pick it in the first place), and even if I wouldn’t recommend this particular piece to have a start with hungarian literature, it will certainly please curious people willing to discover this country and the work of Szilárd Borbély (who is more reputed for his poetry). In brief, a reading that didn’t convince me (the first for this challenge !) but that I am really satisfied to have kept on going until its end, because it revealed a vision of Hungary that I didn’t suspect. Which, I guess, is a sufficient reason to read a book ! > The next review will be about Nouvelles de Tunisie, a collection of short stories by Magellan & Cie (more details here). 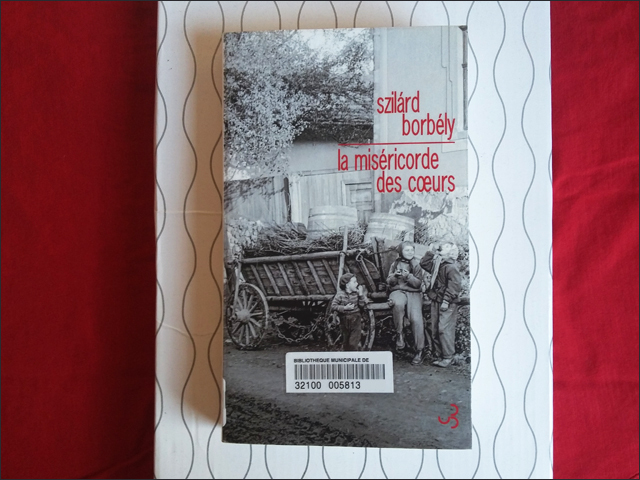 > BORBÉLY, Szilárd – La miséricorde des coeurs, Christian Bourgeois Éditeur – translated from Hungarian by Agnès Járfás. > written listening to “Himnusz” .